K&R Dual and Single Actuator Throttle Controllers. Great for "super" class racing and for the increasing popular cross-talk timing systems. This is the single most important tuning accessory. It reads and stores egt’s for precise engine tuning. Has the capabilities to read 2 cylinders. Clamps to frame or flat surface. 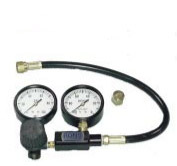 Our kit includes an electric pump for gas, a fuel line with nozzle, a Jaz 1 quart fuel tank and a push button. This system will prime any engine so it will start quickly. Primer Plus system also available from our Midwest Office. Our instruction manual is a must for injection owners. We stock a full line of fittings and hose from #3-#16. We carry some of the hard to find ones. We also have many push-loc fittings and hose. Should be in every ones toolbox! Use to leakdown the barrel valve for the proper setting. Effectively reduces the abrasive smell of alcohol and is the best top lube we have found.